From last 7 years, the phone app development industry has been grown both iOS and Android app stores tremendously & have more than 3.1 Millions of mobile application as of 2019. If you know, 72% of people try to download applications on a regular basis and like to use business phone app more than mobile web. And that is why most of the small business are tends to build business apps for their brand. In fact, if you are able to notice that there are several small businesses have developed their own dedicated business mobile app e.g. small coffee shop, a restaurant, a beauty salon, clothing store apps nearby your place. 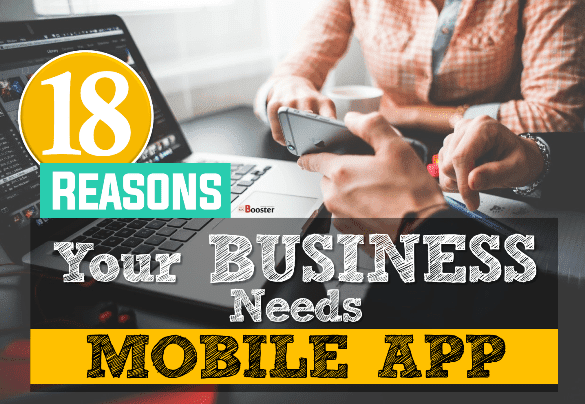 But before you know how to get a mobile app for your business you need to find the reasons why actually you need business phone app. With the growth of mobile app use, many businesses are now prepared to take more control of the social market through their own business phone app. And to hold the leading positions in the social market, you need a business phone app for your brand because mobile apps are the future of social. You don’t need to research stats to know how popular mobile use is with consumers. Businesses are also seeing the benefit of using mobile applications to increase efficiency in the workplace as well. What are its benefits for consumers and the businesses that use them? Here we go. Products and services need to be promoted to sell. The growth of a business depends on it. However, print advertisements are not as effective in this regard anymore, not when mobile marketing became a thing. A mobile application that is customized specifically to market services or products has more of an impact on audiences most of who now stay glued to their smartphones, which makes the whole process more efficient. For example, a business can get more customers faster with the business phone app that its audience uses. Traditional advertising cannot promise instant leads this way. Speaking of readers, business phone app also keeps your target audience engaged with your brand. Statistics show that consumers spend most of their time on native applications. The beauty of apps is that they can be customized with interactive features. Features like in-app tracking and sweepstakes make users stay on your app for longer and also more likely to make purchases. Most smartphone users prefer mobile use over web and apps. A mobile app that is customized according to your brand’s objectives and target audience improves your image. For example, let's say that you hold a travel agency. In this case, your clients would appreciate dedicated business phone app that allows them to book tickets for the specific flights and destinations you specialize in. 4. Dominate the Mobile Space. The statistic shows that mobile users will number in the billions by the end of 2019. Most businesses are already exploring profitable possibilities by developing customized business phone app. Depending on the type of mobile app used, brands can create experiences that appeal to their target audiences. An example of a successful app brand is Google Maps which allows users to map out directions and locate places anywhere across the globe right from their smartphones. A mobile application has the potential for returns. But you don’t always need a consumer-focused tool to ensure that. The business phone app that is designed to streamline and automate crucial business processes works just as well. Consider a CRM (Customer Resource Management) application that helps a sales team process customer requests faster, expedite operations across the sales department and increases revenue in the process. Once your brand launches a business phone app, you are going to get insights on it pretty fast regarding its look, how it works and if it actually accomplishes efficiently what it is designed for. For example, you will start receiving feedback for an app that allows users to order clothes online regarding how easy or hard the process, how great it is or if there are any bugs that are comprising the whole experience. All the insights you receive from your users can be invaluable as a guide to improve your services and ideas for new features that can help you engage your audiences better. Speaking of engagement, statistics show that business phone app is a great way for businesses to keep users engaged with their brand. This makes sense. If your audience can get everything they need right from your application, why would they need to download or use another application or web service? A good example is an HHonors app by the Hilton chain of hotels. The application allows travelers to check in and even acts as their door key. The application helps the Hilton brand go above and beyond customer service and kept travelers engaged at the same time. 9. Open New Chances for Revenue. You can monetize your app by creating new channels for other business opportunities other than what you specialize in. For example, if your business phone app has the potential to become popular with users, put a price tag on it or opt for paid advertising where other businesses pay you to feature their ads on your app. 10. Increase Word of Mouth Marketing. In this age, nothing drives word of mouth faster than mobile use. If your users like your business phone app, they will likely recommend it to other people and give you all the benefits mentioned previously. 11. Add new Features to increase Usage. Probably one of the most convenient aspects of mobile use is it can be updated with new features that you can use to your advantage. Need to launch a new service? Create a customized gaming feature which users can play and win discounts. The best business phone app has all new and updated features to grab the users attention. Customers want value. What will your business or brand provide them that others can’t? With the business phone app, you can provide this value. For example, to drive sales, your brand can create a coupon app which people can use to gain discounts on certain items and save money. Case in point is Starbucks that uses a rewards program to keep customers loyal to its brand. It uses its app to offer app subscribers free beverages and even free song downloads. In this, it drives app downloads and increases its customer base as well. 13. Increase your Online Presence. The more downloads you see for your app receives; the higher will be its ranking online, which means more recognition for your business. And if it receives a higher ranking on Google, it will come up more often for popular keyword searches. The best business phone app helps you drive more targeted actions towards your audience which gives you value where your business needs it the most. Do you want users to sign up for a new service? Create a separate feature for it. A mobile app that makes your employees’ jobs easier also keeps them engaged. Statistics also show that around 65% of decision makers in an enterprise use business phone app to check or send emails. The business phone app can reduce the steps it takes to resolve several business tasks. The time saved can be used for other tasks. Some apps, for example, specialize in facilitating collaborations between decision makers and teams. In this way, different members can talk to one another through a single platform and without being physically present. Employees who have the freedom and flexibility to collaborate or work on projects whenever they get the chance to feel empowered. This, in turn, empowers them to do better. And employees who give them all are a boon for any business hoping to grow. The business phone app that drives enterprise mobility, for example, use cloud services to enable employees to work in the field provided that they have an internet connection. Mobile users prefer immediate gratification regardless of whether they are general consumers or employees of an organization. And a mobile application that is customized to their needs in perspective is the best way to do it. The best business phone app holds a lot of potentials especially when it comes to streamlining important business objectives and giving users or consumers real browsing experiences. Businesses that opt to go mobile have a lot to gain. Article By Jeffrey Archer — is a senior Project Manager in a software development company of USA. He started our professional career before 10 years. Currently, he is leading our team to develop business intelligence apps for several activities.